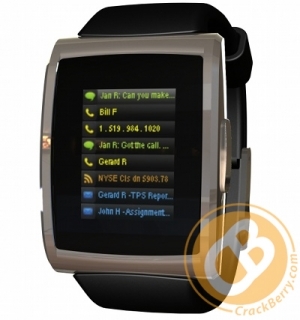 BlackBerry Watch First Images | BlackBerry Blast! It looks like the rumored BlackBerry watch is a real thing after all. CrackBerry got its hands on the first rendering of the new device. The BlackBerry Watch will supposedly be named the "Impulse" smartwatch. The Impulse smartwatch will is not a replacement for the BlackBerry, but rather an accessory that works with it. The Impulse is intended to be used at those times when your BlackBerry is tucked away in your pocket. You can glance over at the watch and see if the message you receive warrants taking the BB out of your pocket.